I hope everyone is having a good holiday. Rather than going to a party this year I stayed home with my fiance and his younger sister, Kai. We listened to Halloween music, drank apple cider, watched scary movies, and carved pumpkins. This was the first time I had ever carved a pumpkin. 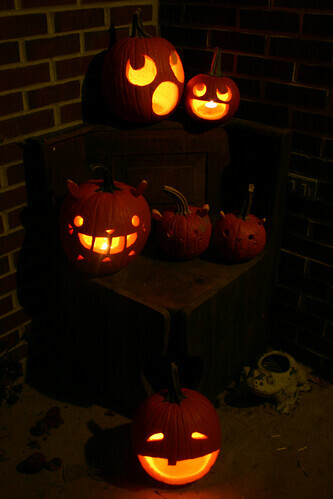 The three Totoro are my pumpkins. I wanted to carve something cute and different than a plain lack-o'-lantern. Sadly the tiny Totoro's candle went out before Kai could take the picture and the middle Totoro's candle was dying as the picture was being taken. Brad's pumpkin is on the ground and top two pumpkins are Kai's. Beeyond: Thank you! We thought they were all very adorable. I was sure my fiance was going to make a scary jack-o'-lantern, but it was funny that we all made cute pumpkin designs. Awwe! I like your pumpkin, and it's really good for being your first time. I also made a Totoro pumpkin this year, weird! xo.- R: Thank you! I knew it would be a lot of work, but it was fun. Great minds think alike and Totoro pumpkins are cute. Hello, Kristen, I`m your newest follower. (: I can't help but fall in love with your blog! Everything is so pretty and charming, please, never stop. Hope you had a lovely Halloween. not wendy: Thank you very much!! ❤ I am glad you enjoy Princessly Living. I plan to keep this blog going for a long time to come. I hope you will remain a follower. Why does happy ever after have to end?